I have had to overcome a lot since my MS has developed into MS. At the beginning it was a dizzy feeling and because you were never a lover of sporting activities, you were never really as fit as the others. However things progressed, and with the confirmation that I was actually not fit because it all hung together with something called MS I had to begin to take my life into my own hands. Of course I had very good support from my neurologist and doctor but there is no cure. My first challenge was injecting every second day which serves the purpose of slowing down the progress of the illness. I had two visits from the lady that organises my medication to show me how to do it and afterwards it was I, me and myself and a “mix-jet” syringe. There was a powder medicine to screw onto the syringe which was filled with liquid (something like alcohol I suppose). You mixed it together and eventually the injection was ready. Just stick the needle into an arm, leg, solar plexis, or stomach, alternating each time with the right side or the left side. This means that not the same part of the body is attacked each time. After three years it has become part of daily life. Then there was the wheelchair, an electric one as I wanted to go places. The first journey on my own was in the neighbouring parts of the village, not wanting to risk too much. With time I was up the hill to the local castle and after a year I did my first trip to town which had to be overcome. Now the ice was broken and no holds barred. I was off to town on every market day, the annual trade fair, and even the cheese days when they had cows on the market place. I am probably now known as the lady in the wheelchair with the camera. Of course the camera comes with me, make the most of it I say. Otherwise for visits to the doc in town or shopping I leave the wheelchair at home. In town where I have to walk to places, I belong to the walker brigade – the golden oldies pushing their four wheeled trollies in front of them for support. At the supermarket they supply their own trolley for the shopping and at home I have the walker, my stick and various pieces of furniture that I can hold onto for support. The latest development can be seen above. Today the plumber arrived and converted the shower into a place where I can be safe. I now have a collapsible seat which folds into the wall when not use, a wire basket for the soap etc. and a grip for helping to stand from the seat. Even showering will now become an adventure. What could be better. We also have a real bathroom, but I decided to have the shower converted. It is more comfortable. I wish I could do that — maybe someday. 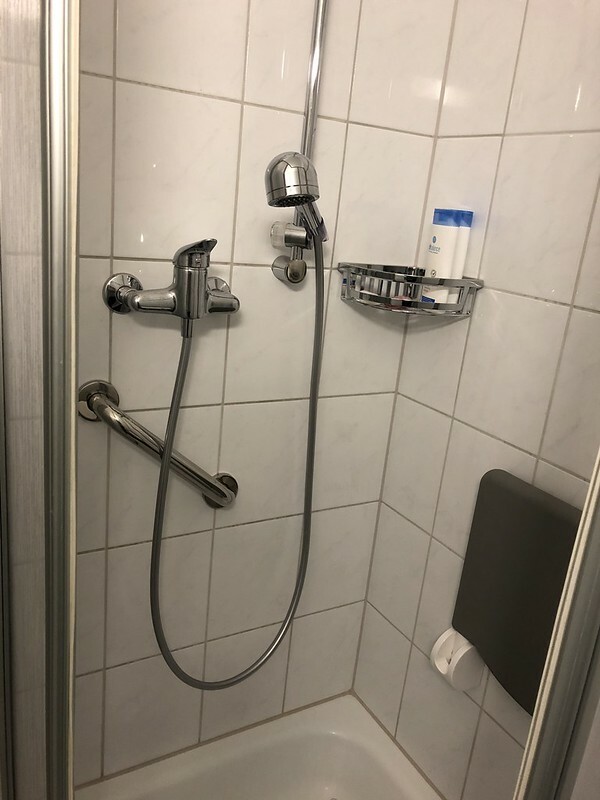 I always shower, so I don't need the tub, and when my hip was bad, it was hard to get my leg over the edge. I have no idea what the future holds for my mobility. In the wheel-chair adapted house my parents' built in Colorado Springs, we built a special shower for my dad so he could take his wheelchair into it. No motorized wheelchairs back then, so… Since we ended up giving him his showers, it was lucky for us that we'd built it that way. I had to stop using the bath as I cannot climb into it, but had to slide along the big ledge at the back onto a seat I had. The seat broke and it was too risky for me to get back on the ledge. I tried our shower and found it perfect, but had a word with our plumber for improvements and this is the result. The shower is just the right size, not too big. I bought my wheelchair myself. If I had waited for financing it would have been a mechanical one. They would never have financed an electric one. I’m really happy you bought that wheelchair because you’re free and I get to see great photos. Very nice setup! The folding seat as well. Your shower really is pretty. Functional, too. We still have to climb the tub to get into the shower….and we don’t even use the tub! I really like how yours looks. I think I would like this…..
We have a fully functioning tub, also complete with shower, but I can no longer climb into it. My legs cannot manage. 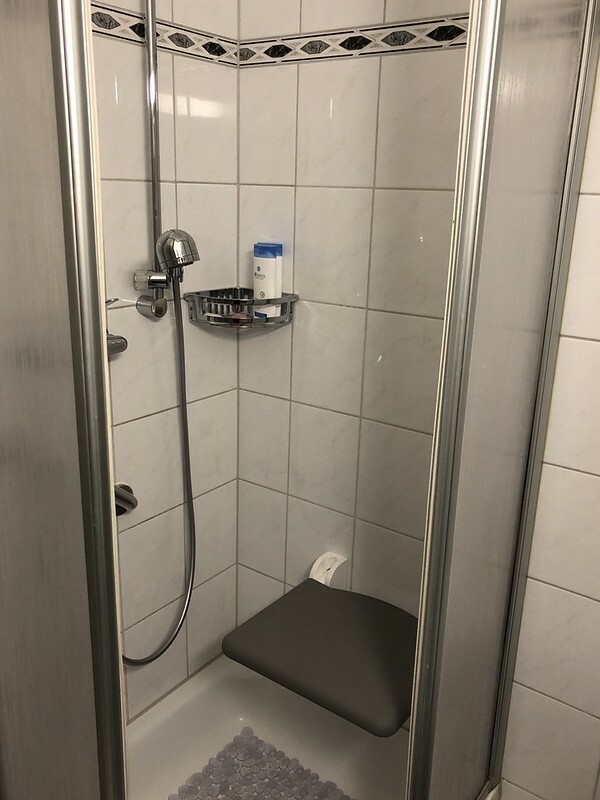 I can use the shower easily, but cannot bend to reach my legs. Now I have a nice comfortable seat. That is very much what ours is going to look like, but it will be a bit longer because it’s replacing the bathrub. But otherwise, very similar.